But “fast casual” is the buzzword Disney is using to describe what has long been heralded as Hollywood Studios’ worst quick service, which is an achievement in its own right. I mean Catalina Eddie’s is literally a “pizzeria” that doesn’t have marinara or pizza sauce on hand so they literally serve their breadsticks with Ken’s Caesar Salad Dressing. If people still opt for the salad dressing breadsticks over whatever you’ve got going, then it might be time…well…time to make a change. And here we are. People will occasionally ask me, “Josh, why are you so bitter?” And while we don’t have time for that, at least 62.4% of it is the time I’ve spent at ABC Commissary over the years. 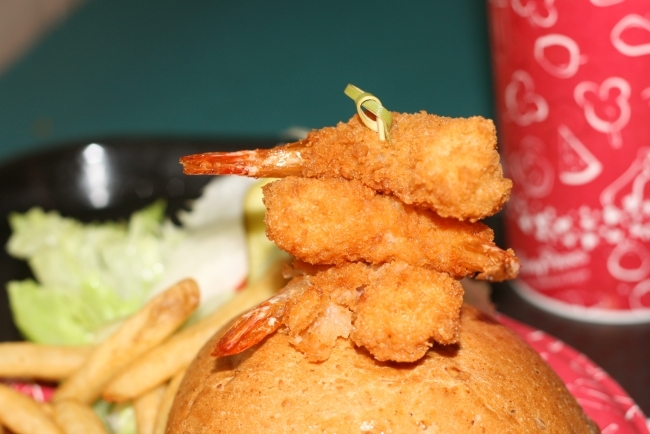 There was this “Surf and Turf” burger, which, for no reason that I’ve ever been able to surmise, is topped with three fried shrimp attached via toothpick. Sodium and regret apparently combine to create one of the yellowest plates of food ever served. But it hasn’t been all bad. The Asian Salad with choice of Salmon or Chicken alongside a delicious ginger dressing, fresh vegetables, and wonton sticks, was delicious and one of the best fast food salads on property. And no, it’s not available anymore. For a short time, a Couscous, Quinoa, and Arugula Salad was offered. Very fresh and incredibly unique. And no, not available. The Chicken Curry had a cult following back in the day (2011) – spicy and flavorful. And no longer available. So, I guess you could say that, “ABC Commissary is kind of a mixed bag.” If that bag was filled with sand and used by Indiana Jones in an attempt to steal the Golden Idol in Raiders of the Lost Ark. On one hand, it seems like it might get the job done at a price lower than other more reliable methods. On the other hand, using it is probably going to kill us. Because why would you want to start December off on the wrong foot? After perusing the menu that a cast member will probably hand you as you enter the building, the first thing you’ll probably notice upon looking overhead is pricing. New ABC Commissary ain’t cheap, leading with a $17.49 Chimichurri Sirloin Steak before switching to the Southwest Burger, which comes in at “just” $14.49. The Mediterranean Salad is technically entree #5, but appears on the same screen. It’s $9.99 vegetarian or $12.99 with Seared Chicken Breast or $13.99 with Seared Salmon. Speaking of seared, a Lemon Pepper Salmon Served with Couscous and Sauteed Green Beans is offered at $14.99 and the Barbecued Chicken & Ribs Combo Platter Served with Coleslaw and Steak Fries moves over here from Fairfax Fare for $17.19. The usual drinks are available. Kids’ Meals are similar to the adult entrees with Salmon, Barbecued Chicken, or a Cheeseburger, in addition to the less expensive Power Pack. A couple of “Appetizers” are also available, in addition to the seasonal cupcake. Disney is currently serving both the Autumn and Holiday Cupcakes, but each quick service typically offers one or the other. On the appetizer front, both are parts of other dishes – the Cheddar Jalapeno Poppers arrive with the Southwest Burger and the Mediterranean Hummus is the same thing as what’s served alongside the Mediterranean Salad. The Chicken Nuggets are still there, as are the Chicken Club and Standard Burger. The same Chicken & Ribs Combo and Mediterranean Salads are also available. In addition to the menu changes, dinner service also brings food delivery similar to Be Our Guest Restaurant at Magic Kingdom. You’ll first order your food from the register as usual. But instead of waiting there for someone to hand you your order, you’ll instead be handed a pager and a cast member will deliver your food to whatever table you sit at when it’s ready. So how was the food? I’m not sure. We didn’t actually order anything. Just kidding. This is the $14.99 Lemon Pepper Salmon – Seared Salmon served with Couscous and sautéed Green Beans. I was really impressed by this – the salmon had a nice natural color to it with a flaky and buttery smooth texture. It was almost glowing on top of the couscous with an attractive sprinkle of pepper on top. It was also a large portion that probably rings in around eight ounces. The amount of lemon you squeeze on top is up to you with the included slice of citrus. Ordinarily, couscous is “Disney speak” for “rice pilaf,” but the semolina pasta here is the real deal with thick pearls, almost like “real” ptitim. However, I thought it was a touch on the bland side. I’m not sure if ABC Comm. is really the place for subtlety. But I appreciated what they were trying to do and it wasn’t rice. Green beans are perhaps difficult to do well on this scale, but they were fresher than the shriveled butter bombs that Cosmic Ray’s serves and retained some crunch. I think the sides would have fared better in this review if the fish wasn’t so good. Overall, I was impressed. Oh, I forgot our appetizer, the $5.49 Cheddar Jalapeno Poppers served with Ranch Dipping Sauce. Five of these suckers come to an order, somewhat delicately placed along the rim of the bowl with the ranch in the middle. While we’re not exactly in haute cuisine territory here, which is shocking given the venue, these were surprisingly pleasing. Perfectly fried, the exterior was thin and crispy followed by a layer of crunchy jalapeno before giving way to a creamy cheese center. I took a bite out of the first one and the thing kind of exploded all over the place with cheese flying everywhere. While they might not look like much in the bowl, they pack a lot of flavor and it’s a deceptively filling dish. The $17.49 Chimichurri Steak – Sirloin Steak topped with Chimichurri Sauce and served with Fire-roasted Corn Medley and Steak Fries. This is my fifth or sixth run-in with Disney’s version of the fast food steak and this was the second best, eclipsed only by the original New York Strip Steak from Liberty Inn over at Epcot, if you can believe that. I was surprised at how pink it was inside and while it was tougher than what Disney has been marketing as the NY cut, the meat here was a lot more flavorful. The chimichurri sauce, which provides some garlic, oregano, and olive oil to the flavor profile, also helps add some moisture to the meat, in addition to a burst of color on the plate. I was somewhat bemused that it was served with a side of Frank’s Original Red Hot Sauce by default, but as long as it doesn’t magically transport me to STK, we’re okay in my book. The “steak frites” are a departure from the near ubiquity of Disney’s quick service french fry. These are indeed thicker and meatier with more potato flavor than their much thinner, saltier cousin, but at least what we were served wasn’t particularly crispy. I’m always looking for that crunchy snap when it comes to thicker fries and that wasn’t present. With that said, they were just fine and you may have better luck. The Roasted Corn Medley, which is now served at a variety of locations including Fairfax Fare, is as superfluous as it is flavorless. I think the intended style is for a crispiness to the exterior of each kernel, but they just come up limp and mealy. Not great. Disney Dining Plan users are probably already honing in on this one based on cost, but I think the steak is $3 or $4 overpriced out of pocket. A similar steak, pictured above, is served with fried shrimp and broccoli over at Liberty Inn for $15 or $2.50 less than what’s served here. With the Mediterranean Salad appearing so many times on the online menu, I added the $9.99 vegetarian version to my order. Described as “Mixed Greens, Tomatoes, Onions, Peppers, Kalamata Olives and Feta Cheese tossed in a Greek Vinaigrette and served with Hummus and Pita Chips,” the flavor reminded me a lot of the “Greek Salad” that used to be served at Studio Catering Co. This is that salad, which is much more sparse than ABC’s version, though it was only $7.19 when it glowed away in April. Anyway, the Greek Vinaigrette is a bit heavy handed and lays the foundation for what is a very salty affair when paired with quite a bit of the tangy feta cheese. The mixed greens also don’t hold up quite as well as your crunchier iceberg under the weight of the dressing and the salad ended up being a bit soggy. But it’s packed with “stuff” and there’s something about how the flavor comes together that it begs to be eaten even when you’re not sure why you’re still eating. That’s salt for you, I guess. On the plus side, I was expecting Stacy’s Pita Chips on the side, but what’s served is just barely soft on the outside and quite crunchy in the center, pairing very nicely with the hummus. It adds a little heft to the salad and fixes my main gripe with the Catering Co. version. I think chicken is your best bet on the protein and that would have probably helped absorb some of the dressing and make it “feel” like more than just a really big side salad. My guess is they are loading up each salad with the same amount of dressing regardless of whether chicken or salmon is involved and that ratio will probably be adjusted as soon as someone can figure out how they work. In addition to the food being delivered tableside, which almost makes it Victoria & Albert’s as they also bring you your food there, a rolled napkin filled with plastic cutlery will also arrive. The shiny spoon, fork, and knife along with the heavier duty napkin are welcome additions. As I was looking around Disney’s materials on the subject, I was amused to see references to the “backlot” and “chicken curry” from the overview. The curry has been gone for something like four years while the Backlot reference reminds us that the Tour closed well over two years ago now. The word commissary is defined as, “a restaurant in a movie studio, military base, prison, or other institution” and Disney’s version certainly fits that bill, though I’m not sure which one of those examples is best represented here. At a minimum, ABC Commissary offers what is usually ample air-conditioned seating inside as well as plenty of blogger-watching outposts outdoors with umbrellas and awnings to protect from the rain. That makes for what is usually the most comfortable of the Studios’ quick service seating areas, though Backlot may be more fun when it’s less busy. So Should I Try This ABC Commissary Fast Casual Dinner Thing? Those on the Dining Plan should definitely consider it. I wouldn’t necessarily say that the menu is overpriced versus other Disney quick service options – the Chicken & Rib plate is exactly the same as other outlets for the same money. But when you’re talking about $17 steaks and $15 salmon filets, you’re only a couple dollars away from what is potentially a superior experience at a nearby table service restaurant. The Derby Sliders – Wagyu Beef with Cognac-Mustard Aïoli, Smoked Gouda Cheese, Bacon, and Avocado and Duck Confit, Taleggio Cheese, Chipotle Vegetable Slaw, Sweet Onion-Orange Conserve, and crispy Leeks are $17 at Hollywood Brown Derby Lounge (the outdoor lounge area) all day long. Vastly superior to that steak. I’ve underlined the entrees that are the same or less expensive than Commissary’s Chimichurri Steak AND YES I KNOW THE BURGER IS TECHNICALLY ONE CENT MORE EXPENSIVE BUT PLEASE ALLOW ME TO MAKE MY POINT HERE EVEN IF THE TRUTH IS STRETCHED, and you have nine (eight) choices. Granted, they aren’t steaks. And a 20% tip adds to the cost for those that don’t carry a Tables in Wonderland card. But for “just” $1.50 more than I paid for my salmon, I could head next door and get it in a tasty sandwich and enjoy a much more unique atmosphere. That probably makes the Italian restaurant less attractive to the budget conscious. Pretty much everything is now $20+. Even the Fried Chicken at 50’s Prime Time is up to $21. But forget everything you thought you knew about ABC Comm. Much like Electric Umbrella over at Epcot, whether or not you had an objectively poor meal here back in September 2012 is irrelevant. It’s a different beast now. And while it’s still early, I’m not sure it’s going to be debatable that ABC now serves the best quick service dinner at Hollywood Studios – both in terms of quality and service. Is it a couple dollars overpriced compared to similar options? In places, probably. But an extra two bucks for the steak probably isn’t going to sink anybody’s ship. And if you’re on the Disney Dining Plan, it’s almost a no-brainer. While we’re on the subject of quick service food at Disney’s Hollywood Studios, we’ll check out some new entrees at Fairfax Fare next. No more Picnic Burger at Sci-Fi? Unless it’s one of the “seasonal” burgers I suppose. That fried chicken at 50’sPT is good though. I was pleasantly surprised when I ate at the lounge and the chicken came out in less than 10 min. As unusual as this may sound, my wife is allergic to lemon so we would be hesitant to order the salmon at ABC. Since salmon is her favorite thing to order, and since you tried it, does it look like they just sprinkled lemon pepper on the fish or was it cooked with the seasonings ahead of time? I don’t think I could say for sure at what point the lemon comes into play, unfortunately. They are likely pre-frozen filets that may already be seasoned to an extent. There wasn’t much lemon flavor without squeezing the lemon over the top, but if it’s a severe allergy, it could still come into play I would think. Steak hot sauce for the win!! I could totally inhale those jalapeño poppers. If they’re still there’s in October (highly unlikely) I’ll have to try them. I’ve been an avid reader of your website, and have tended to check it everyday for the last few years. I find your sarcasm and cynicism very refreshing, and downright funny! I would like to share my opinion about the direction your blog has taken lately (feel free to ignore this completely if you like, I just thought I’d share my opinion). I’ve noticed lately that the majority of your blog posts are more about what’s new around the World (chasing down new menu’s, new shows, new experiences), and less about the everyday things at Disney World. While I appreciated all the effort this must take, I feel it diminishes what made your blog unique in the first place. There are hundreds of other Disney World blogs out there, and in the past, you’ve differentiated yourself by not posting about the same minutia every other blog is posting about. For instance, I’m personally less interested in how a burger reviews at an obscure quick service diner, and more interested in pictures of Christmas decorations at Wilderness Lodge. I’m less interested in how good some new paid-experience somewhere on property is, and more interested in how wait times looked over Thanksgiving (remember trying to spot the smile in the hoards at the MK… fun times). In short, your blog used to present like a guy going into Disney to take sweet pictures, make me laugh, and most importantly, give me a bit of escapism. Now it’s starting to read like a Disney World news site, of which there are 5 million already. Please continue to differentiate yourself like you used to! I beg to differ. This is the first place I go to when I know there are ‘new’ things happening. I prefer to read Josh’s take on things instead of the perfect, glossy reviews on most other sites. I enjoy those sites also, but prefer here. I think there is a good mix of old and new here. I totally agree. If I want an honest review of something, this is where I know I can find it. I’m also not quite sure I understand the criticism. Within just the last couple weeks, Josh has featured a detailed look at everything going on in Magic Kingdom as well as pictures of holiday decorations at Magic Kingdom, Hollywood Studios, and Port Orleans French Quarter. Not long before he was devoting entire posts to the individual World Showcase countries despite the fact that very little has changed there. I have to agree that Josh is doing a great job of featuring new items and going back to explore those things that have been around awhile. I remember Josh set up a survey some time ago concerning what the readers would want to see more of in the blog . I don’t recall the results or if the direction changed as a result of same but there is some nostalgia for those earlier posts. I also understand that you need different subjects to cover to keep up the snark and bitterness. Walt Disney World is undergoing changes and throwing these various upcharge items at the customer that I’m grateful is being critically reviewed and the reviewer is not being comped cupcakes or special dinners. I agree with AJ. There are plenty of other blogs to read about Disney food and the new happenings around the park, but Josh tells it like it really is and in an amusing way too. I disagree as well. Josh delivers and honest review and for those of us that have been there many times we crave the new stuff. Thanks Josh we may consider ABC commissary for the first time. I completely agree with AJ here. I like the idea of the cast members delivering your food. We ate there this past February. It was busy and the counter area was crowded with people waiting for their food. It will be nice to just be able to order and sit.